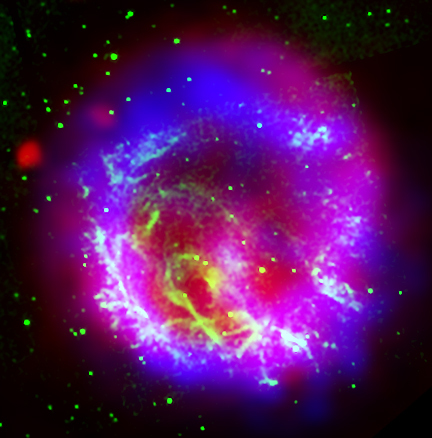 Color composite of the supernova remnant E0102-72: X-ray (blue), optical (green), and radio (red). E0102-72 is the remnant of a star that exploded in a nearby galaxy known as the Small Magellanic Cloud. The galaxy is approximately 190,000 light years from Earth, so we see the remnant as it was about 190,000 years ago, around a thousand years after the explosion occurred. The star exploded outward at speeds in excess of 20 million kilometers per hr (12 million mph) and collided with surrounding gas. This collision produced two shock waves, or cosmic sonic booms one traveling outward, and the other rebounding back into the material ejected by the explosion. The radio image was made using the Australia Telescope Compact Array. The radio waves are due to extremely high-energy electrons spiraling around magnetic field lines in the gas and trace the outward moving shock wave. 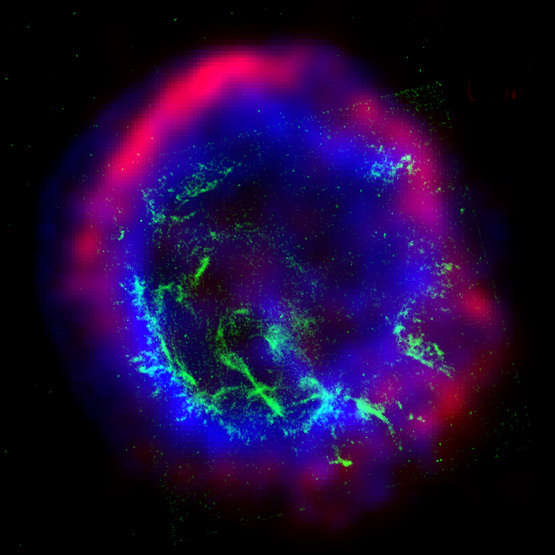 The Chandra X-ray image, shown in blue, shows gas that has been heated to millions of degrees Celsius by the rebounding, or reverse shock wave. The X-ray data show that this gas is rich in oxygen and neon. These elements were created by nuclear reactions inside the star and hurled into space by the supernova. The Hubble Space Telescope optical image shows dense clumps of oxygen gas that have "cooled" to about 30,000 degree Celsius. Images such as these, taken with different types of telescopes, give astronomers a much more complete picture of supernova explosions. They can map how the elements necessary for life are dispersed, and measure the energy of the matter as it expands into the galaxy. Reference: T. J. Gaetz et al. 2000, "Chandra X-ray Observatory Arsecond Imaging of the Young Oxygen-Rich Supernova Remnant 1E0102.2-7219", Astrophysical Journal Letters, 534, L47.